IOS: Testing allowas-in and remove-private-as all replace-as on IOS devices using two CPEs/PEs from an external AS (65001) connected to the local AS (55555). In both examples below the 10.0.0.2/32 prefix isn't installed to FIB on PE1 because the changes are only being tested on PE2! All devices run c7200-advipservicesk9-mz.152-4.M7.bin. 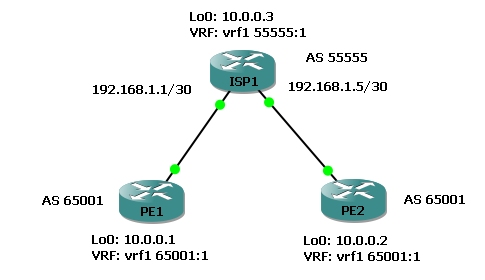 Configuring "allowas-in" on PE2 on a VPNv4 peering (MPLS Opt B) to upstream router ISP1 allows 10.0.0.1/32 to be received inside vrf1 despite having AS 65001 in the AS path (it's own AS number going against BGP loop prevention). *>  10.0.0.1/32      192.168.1.5                            0 55555 65001 ? *   10.0.0.2/32      192.168.1.5                            0 55555 65001 ? *>  10.0.0.3/32      192.168.1.5              0             0 55555 ? *>  10.0.0.2/32      0.0.0.0                  0         32768 ? Since AS 65001 is a private AS range we can use the "remove-private-as" feature on ISP1 by configuring ISP1 with "neighbor 192.168.1.6 remove-private-as all replace-as" under the VPNv4 peer configuration. ISP1 removes any instance of AS 65001 in the AS path for BGP updates AND it replaces them with a value of AS 55555 to keep the AS path length. If the keywords "all replace-as" aren't support on the current IOS image then the private AS is removed but not replaced, unless the AS path contains only private AS numbers in which case no action is performed! *>  10.0.0.1/32      192.168.1.5                            0 55555 55555 ?